Tsumugi no Yakata (つむぎの館) is a comprehensive facility of Yuki Tsumugi Weaving. Yuki Tsumugi is the traditional silk weaving which performed for long time in Yuki. Tsumugi no Yakata has shops which sales all kinds of Yuki Tsumugi produces, demonstrations of weaving Yuki Tsumugi, experiencing weaving and coloring, display house of Yuki Tsumugi and its museum. The facility is run by Okujun, the wholesaler of Yuki Tsumugi. Admission: shop and demonstration Free, Museum 200 yen,and experience 800 ~ yen. Make a reservation for experiencing. 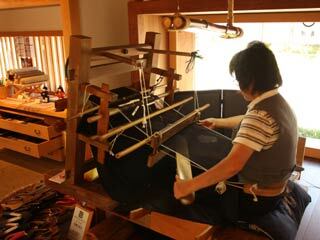 ... is the traditional silk weaving which performed for long time in Yuki. The history of Yuki Tsumugi has over 2,000 years. It appears in Japanese myth. It was developed as the secondary industry of Yuki Farmers. Today, it is registered as the intangible cultural asset and important craftworks of Japan. It is commonly used for clothing in Edo period. Yuki Tsumugi is widely used for all kinds of products not only Kimono, Japanese clothes, but also the groceries. Some of the complicated design takes over a year to make it because it's all hand made. The unique feature of Yuki Tsumugi is making a floss silk first and make a silk thread from it. Therefore, it has an extra softness compare to the ordinary silk products. All the Yuki Tsumugi products has extra softness, richness of volume, and very light. It has a pleasant texture and feels nice. ... is the only museum of Yuki Tsumugi in Japan. It displays the traditional process of the weaving, books and records of the shop, old clothes and history record of Yuki Tsumugi. ... is the information and shops. This shop has all kinds of modern designed accessories and groceries, such as ties, shawls, wallet, purse which made from of Yuki Tsumugi. The weaving demonstration is shown here. ... is the experience house which you can try weaving and coloring. is 150 years old house which used for display of Yuki Tsumugi. You can see and tough Yuki Tsumugi Weaving. Yuki Tsumugi Weaving is great for making Kimono. ... is Cafe and Gallery of Yuki Tsumugi. The building is one of Misegura in Yuki. You can enjoy history of Yuki from the building and Yuki Tsumugi at this cafe shop. It has a great Yude Manju.